There has been a lot of talk about a possible storm for this weekend. It still appears we are going to see a storm move through Saturday, but it might not be as much of a snow machine as it will be a rain, cold air, and wind machine. The computer models are starting (finally) to come in to alignment for the storm. For the last week the European model has kept the storm to the north and the GFS has kept the storm further south. A more southerly track would mean snow for the KFVS viewing area. A more northerly track would mean the storm would be warmer and be rain. The winner appears to be the European model. 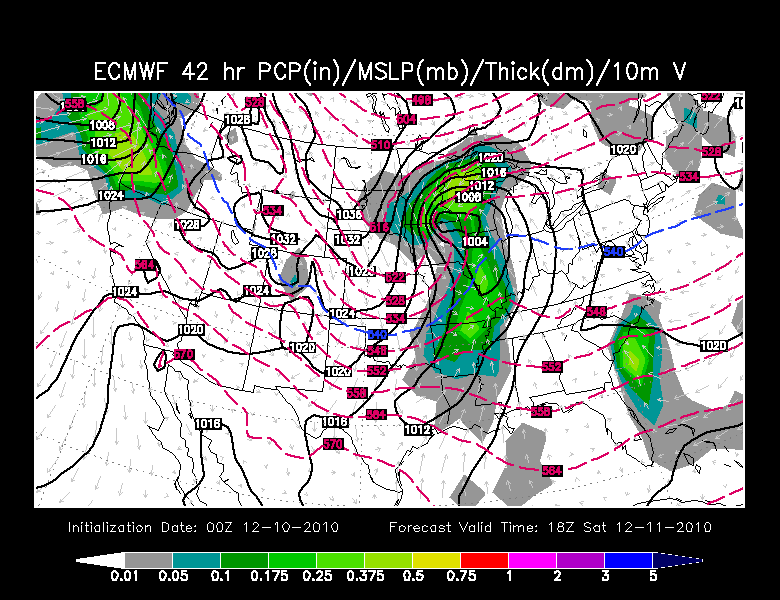 Here is the European model's depiction of 12pm CT Saturday. It takes the low through Iowa and spins it up over Wisconsin. A cold front will be sweeping through southwest/northeast Missouri. Along the cold front showers and thunderstorms will break out. Cold air begins to sweep in behind the front. If there is any moisture left over when the cold air comes in we could see a little changeover, but I don't think there will be much to talk about. Even as the upper low swings through on Sunday, I think the small amount of moisture with the system will stay north of southeast Missouri, southern Illinois, and western Kentucky. At best we could see some flurries during the day Sunday. I think it will be much of the same for those in central and southern Indiana. Rain will begin to move in Saturday night. Cold air will come in on the backside of the storm. You could see a little bit of snow on the backside of the system as the upper-level low swings through. I wouldn't be surprised if there is 0.5" to 1.5" of snow on the ground by Sunday night. One of our hi-resolution models is trying to hint at some lake effect snow bands making their way as far south as Muncie by Sunday afternoon, but we'll see if that really pans out. The bigger story for Sunday will be the cold air and winds. It will be interesting to watch the New England Patriots vs Chicago Bears football game Sunday afternoon in Chicago (which you can watch on KFVS12). Winds will be gusting over 40 mph in Chicago that day. 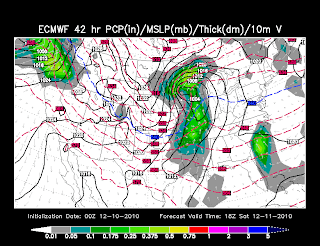 Long range computer models are still hinting at a pretty potent storm developing around December 22-24 that will sweep through the Midwest and likely cause some travel issues for Christmas. It is way to early to tell if we are talking rain or snow yet. I'm back from my trip to Florida and getting ready to head back to work tomorrow after some time away.